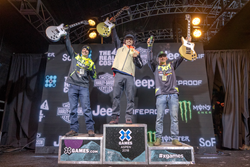 Monster Energy’s Kody Kamm claimed a podium spot in Snow BikeCross with a strong Bronze- medal finish in a 20-lap final race at X Games Aspen 2018. Talk about a grueling race to the finish line. Today’s Snow BikeCross event at X Games Aspen 2018 turned into a test of endurance under overcast skies on the challenging course at Buttermilk Mountain. 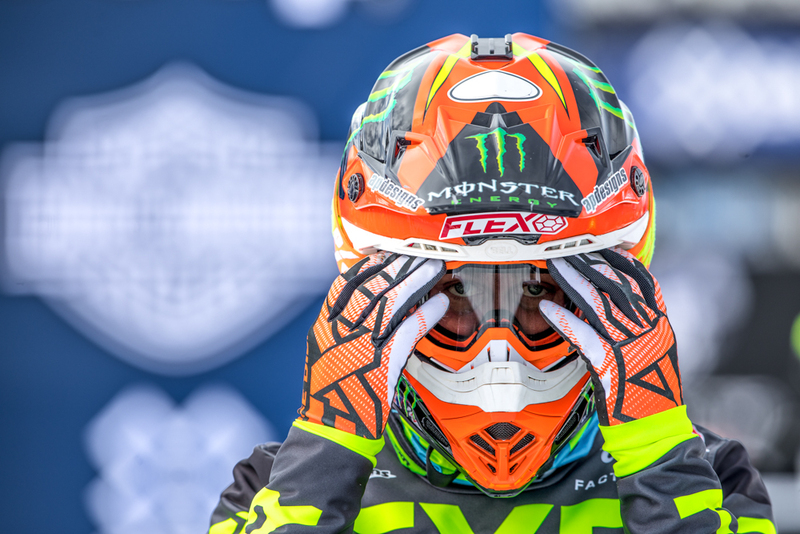 Battling poor visibility and treacherous ice patches, Monster Energy’s Kody Kamm claimed a podium spot with a strong Bronze medal finish in a 20-lap final race. This marks the third X Games medal for the 23-year-old from Kenosha, Wisconsin, who shared today’s podium with Canadians Brock Hoyer (Silver) and Cody Matechuk (Gold). Now in its second year as an official X Games event, Snow BikeCross attracts snowmobile racers and motocross athletes looking to trade dirt tracks for snow dust. 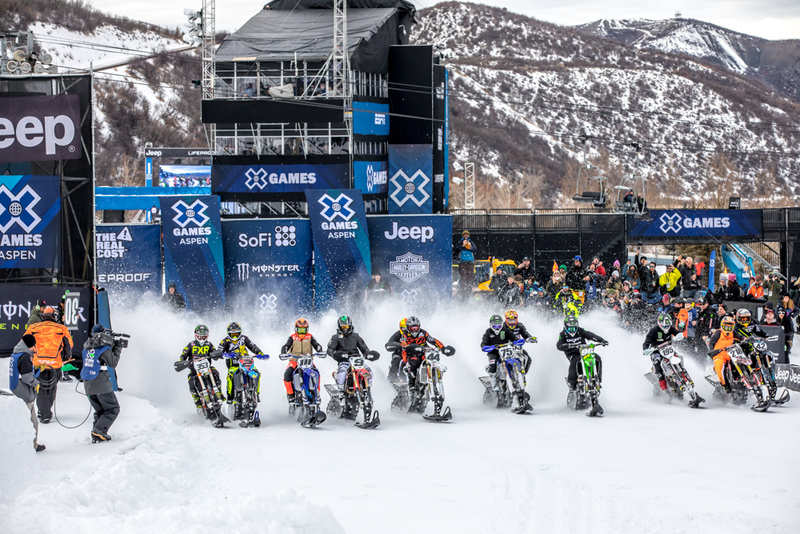 Riders compete on motocross bikes transformed into snow bikes via custom conversion kits featuring rear-mounted track drives and skis for steering. Designed by Snow Park Technologies, this year’s Snow BikeCross course challenged riders straight out the gate with a tight and narrow 180-degree right-hand turn near the starting position. After threading the needle and battling for an early lead, racers had to navigate a series of technical moguls and steep turns, ending each lap with a huge jump near the finish line. Today’s heavily contested qualifiers narrowed the pack of 20 competitors to 12 finalists in two heats at 10 laps each. The formula for staying ahead of the pack consisted of building an early lead and finding a safe line away from the hidden patches of ice that spread across the course as the race continued. The ice took out one of the top seeds of today’s race, four-time Monster Energy Super Cross winner Ryan Villopoto, who walked away unscathed from a crash but missed the final. Making the cut into the 20-lap final race, Monster Energy’s Kamm, Keaton Ward, Axell Hodges, and Josh Hill found themselves facing heavy competition, plus worsening track conditions and low visibility. Right from the start, Cody Matechuk edged into the lead, which he maintained all the way to the finish despite a fall on the 13th lap. Although a grueling 20 laps in length, today’s race saw minimal movement between positions, as Brock Hoyer also commanded his second place from start to finish. Battling from behind, Kamm managed to lock in third place halfway through the final, ultimately finishing 22 seconds behind Matechuk’s 11:42.981 winning time. Today’s Bronze marks Kamm’s third career Winter X Games medal after winning Silver in Snowmobile SnoCross at X Games Aspen 2015 and 2014. 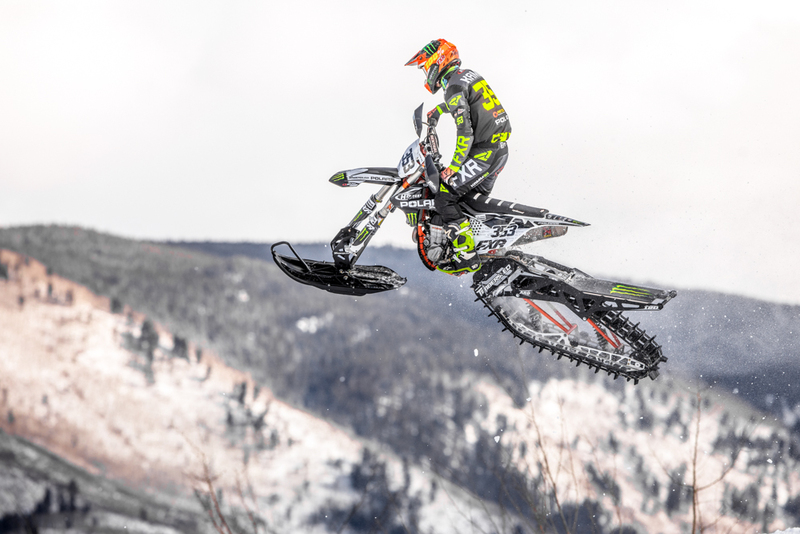 When Kamm learned that Snowmobile SnoCross would not be contested this year – the event was replaced by Snowmobile Speed & Style – he instantly called his sponsor for a snow bike conversion kit and began training. 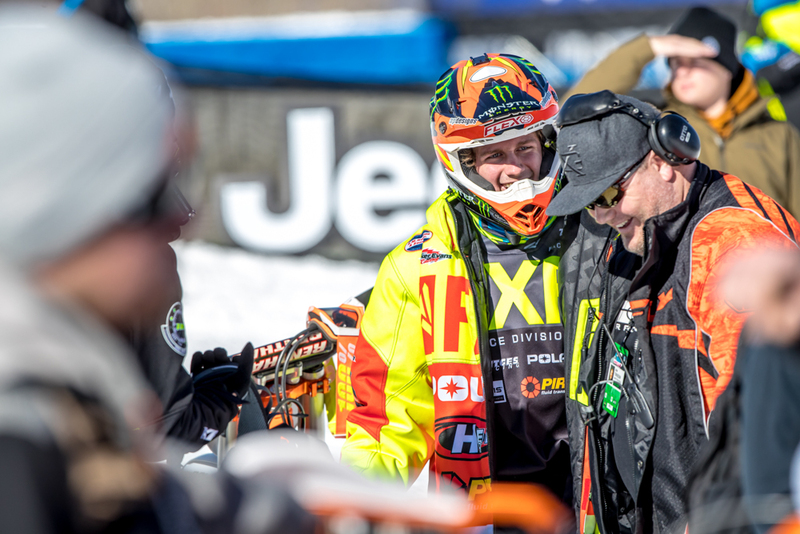 His motivation was rewarded in December 2017 when he took second place at the X Games Snow BikeCross qualifier in Elk River, Minnesota, after only five days total riding a snow bike. Now that Snow BikeCross is in the books, all eyes are on tomorrow’s first-ever Snow Bike Best Trick event at an X Games. With a focus on spectacular aerials, Snow Bike Best Trick draws a field of the best freestylists from both motocross and snowmobile backgrounds. Monster Energy’s line-up includes three-time Moto X Best Trick champ Jackson Strong from Lockhart, Australia. 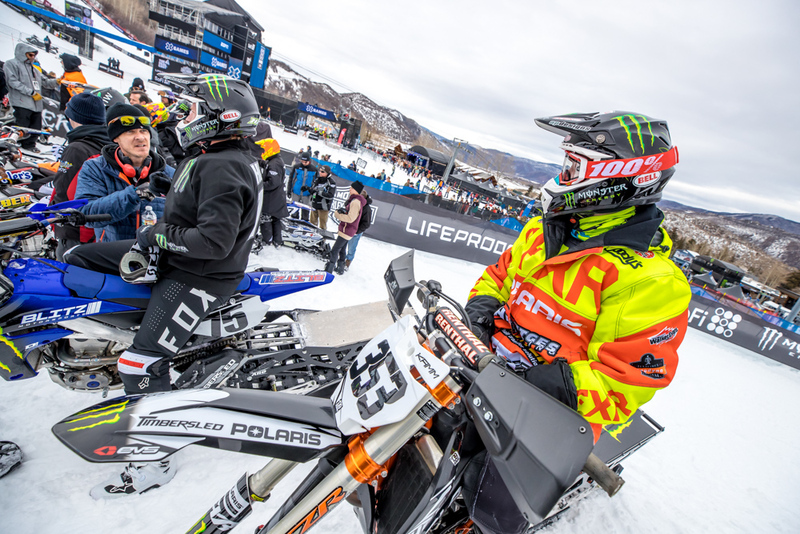 Strong will be joined by Monster Energy teammates Heath Frisby, recognized as one of the innovators in Snowmobile Freestyle with 11 X Games medals to his name, and Brett Turcotte. 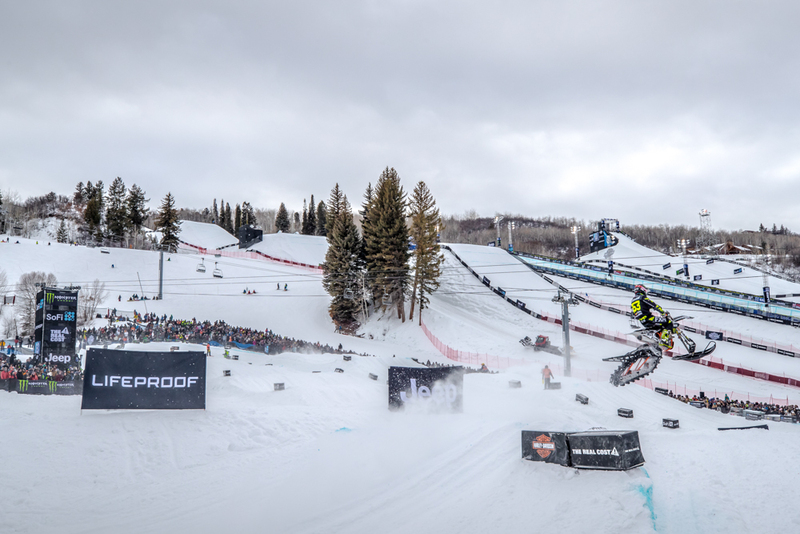 Having already won back-to-back Gold in Snowmobile Freestyle and Snowmobile Speed & Style at this edition of X Games Aspen, Turcotte is shooting for a first-ever Gold medal hat trick at a single winter event – so make sure to tune in tomorrow.